Take care of what's important to you, running your business, let us take care of what's important to your website; keeping your website secure, optimized and ALL components up to date. 1.) We will host and manage your website on a specially configured server, update your Joomla website to the latest minor version, as well as upgrade your website to the latest major version. A major version upgrade could cost anything from R2500 to R25 000 depending on the size of your website, and components you have on your site. An equivalent hosting account could cost from R150 - R399 depending on the supplier. 3.) Install & configure Akeeba Admin Tools. This takes 3 hours, and Admin Tools costs +/-R575 per annum- so this would normally cost you R1625, and keep Akeeba Admin Tools up to date every month. 4.) Install & configure Akeeba Backup Pro This takes 2 hours, Akeeba Backup costs +/- R575 per annum - so this would cost you R1275, and includes a cron job to automatically do weekly backups of your website, so that you never lose your information. 5.) Install & configure Akeeba CMS update. This is a free component, but notifies us when an update for your website is available, so that we can do the update for you as soon as it is released - setup time is 1 hour - so this would cost you R350. 6.) Install & configure Akeeba Live Update. 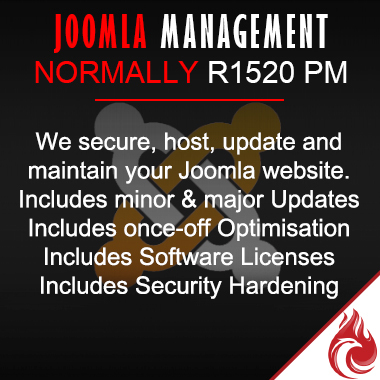 This is a free program, and also assists us in keeping your site up to date, please remember that things can go wrong with this update, and it is only recommended for professionals - 1 hour installation time - so you would normally pay R350. 7.) Install & configure Akeeba UNITE. This is once again a free component, it enables us to do a quick recovery should anything happen to your site - 1 hour setup time - so this would cost you R350. Please note that this is once again only for professionals, don't try this component if you don't know what you are doing. 8.) Install & configure MijoSEF Pro. This component costs +/- R420, and takes a minimum of 2 hours to set up correctly. so this could cost you R1170. This will optimise your website for search engines, automatically install meta keywords, descriptions as well as Tags, and create a sitemap of your website links, and automatically send it to search engines to crawl your website. Don't worry if you dont know the lingo - this is a must have if you want to be found on search engines. 9.) Install & configure ACY Mailing Enterprise. This component allows you to get users to signup on your website for a newsletter, so that you can promote your products / services to them on a weekly / monthly basis. This is imperitave to keep your clients up to date with what is happening in your company. This component costs +/- R1610 and takes 2 hours to set up, so this would cost you R2310. We can also set up a newsletter "template" for R700 once off that you could use to send out your newsletters, or you can design your own. 10.) Install & configure Contact Enhanced full package. If you know Joomla, you know that their normal contact page is useless. With contact enhanced, we can add a map, as well as more fields for your users to fill in, like tel.no, how did you hear about us etc. This component costs +/-R420 per annum and takes 2 hours to set up, so this should cost you R1120. 11.) 30 minutes Skype call once a month to discuss if you are happy with your website, and where it can improve to the value of R350 per month.